I get ready to board my Montreal bound plane from Philadephia when someone mentions we need a visa to get into Canada. Unsurprisingly, being the gospel of truth I am, this statement bears out; I swear to you, the U.S. has customs officials in our Canadian airports, and when the American immigration officer began getting a little overly inquisitive, I calmed his fears by proving my patriotism to our great land, telling him how much I enjoyed seeing our customs officials overseeing America Jr. I walk into our colony only to discover I must have taken the wrong plane, I have landed in Europe; France to be specific. Everyone here speaks French, some people don’t understand English, or at least pretend not to, as per the French custom. I momentarily think of boarding a plane to Canada proper, then decide to exit out into the frigid winter air, deciding to bear the 45% probability that I freeze to death upon exposure to the elements. 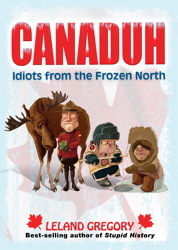 The pre-requisite to settle these frigid lands must have been as follows, lots of heart, zero brains; that's how the country's name was derived; Canaduh.